So... Today's my Birthday. Happy Birthday to me! Hahaha. I actually wrote this post about a month before you're going to read it. (I've been backlogging posts so that I consistently have something to post because I love y'all just that much. Just sayin'.) 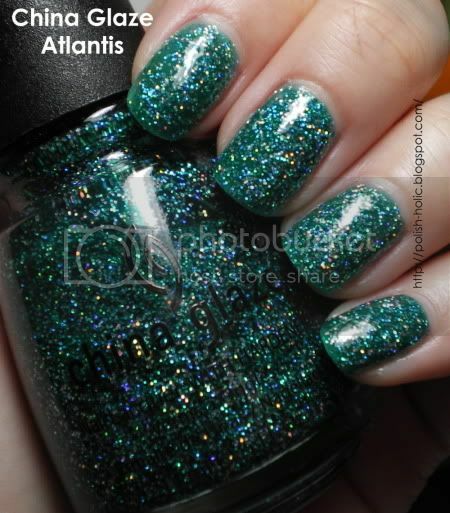 Atlantis probably would have been the perfect Birthday polish, but alas, I didn't time it right. C'est la vie. There will always be something else to wear. Anyhow, here's Katie's pick. Atlantis is the polish embodiment of Atlantis. 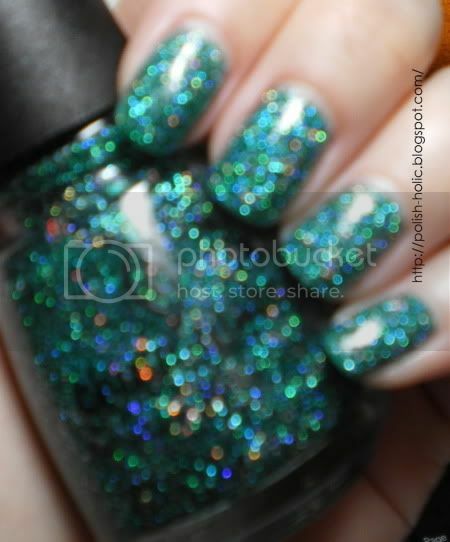 It's this glorious watery turquoise polish loaded with silver and holographic glitter. Blingtacular. Oh this is ever so unprofessional, but who cares? Hahaha. I couldn't stop looking at it at work. Heck, anywhere, for that matter. I purposely blurred out the second photo so you can see how it just goes nuts in the light and how I happened to see it because I don't wear my glasses as long as I can get away with it so everything is usually a little blurry to me. Three coats with top coat. It started off quite sheer, but at three coats you have pretty good coverage. You'll still see slight VNL though. Also make sure to wear topcoat. It was a bit dull without and it's bumpy as heck. But the problem with applying a thick coat of topcoat on top of three already thick coats of glitter is that it chips much too quick. By the next day I already had two large chips. And at the second day, I had my entire left index finger chip off in one sheet. On the third day we were downstairs in the collections with the design team working on mounts for artefacts, when I looked down, my entire left middle finger had chipped off. I was wondering where it popped off when my co-worker found it. Beside an artefact. In a mock-up case. It was the funniest and grossest thing ever. Hahaha. So yes, next time, I'll probably put on a coat of green polish first and then slap on a couple coats of Atlantis, instead. Happy Birthday! What a great color to celebrate! Happy B-Day! What a fantastic polish! i looove it. i have a ring with atlantis in it! oh and ofcourse happy bday! Yay, happy birthday! I like Atlantis on you. Happy birthday!!!!!! That's a beautiful colour on you!